2016-10-05 - Porter Team Punch! 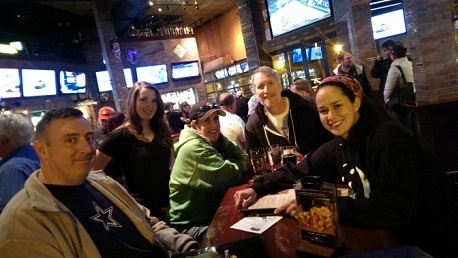 Thank you all you rowdy ruffians for a rousing round of PubGuys Trivia last night at the Mighty World of Beer in Arlington. What fun we had! Some returning players and a whole slew of new teams made for a fun, interesting, and intriguing night of trivia. In game one and by virtue of a nearly perfect third round and a perfect visual round, Porter Pie took home the winning card, while a very solid showing by Team Name Here gained them the second place card...but only just, since Falcon Punch and Quiz in my Pants were knocking on their back door. In the second game, Falcon Punch took an early lead and ran away with first place a full 12 points clear of nearest rivals Team Name Here who once again grabbed that second place card and once again just barely as Bar and a new team, The Ethical Sluts, were storming up the backside. The camaraderie was pleasant, but the competition was rampant. Thank you all for being such good sports and putting up with me while Adam is traveling the world. Divide the current water speed record (in miles per hour) by the number of films directed by Alfred Hitchcock in which Leo G. Carroll appears and tell me the country you would be calling with that international dialing code.